In the wake of a New York Times series that revealed a serious lack of oversight of the gas industry by state regulators, the Governor of Pennsylvania has taken decisive action. He ordered the state Department of Environmental Protection not to report violations by gas companies without approval from his hand picked environmental chief. That’s right - Tom Corbett, the republican governor of Pennsylvania, ordered the Department of Environmental Protection to stop issuing violations against drillers without prior approval from DEP Secretary Micheal Krancer, who he personally selected as chief of the agency. John Hines, the DEP executive deputy secretary, sent an e-mail March 23 to other senior staff, including four regional directors and the head of the department's oil and gas division. "Effective immediately," it said, all violations must first be sent to him and another DEP deputy secretary in Harrisburg - with "final clearance" from Michael Krancer, DEP secretary. "Any waiver from this directive will not be acceptable," Hines wrote. Regional directors reinforced the stern message in their own e-mails to staff. Considering that notices of violation are the inspectors' main tool for enforcing compliance with environmental rules, Governor Corbett has basically kneecapped the DEP’s ability to control wayward hydrofrackers. The new policy has been met with disbelief and anger by people familiar with regulating the industry. "They are putting us on a leash," said the one inspector, who spoke to the Enquirer on condition of anonymity because of a fear of retaliation. "I could not believe it. It's extraordinarily unwise. It's going to cause the public in droves to lose confidence in the inspection process." According to Hanger, there has never been a similar directive in DEP. Hanger said the "extraordinary" policy was akin to forcing a highway trooper to get approval from the head of the state police before writing a ticket. "It is a complete intrusion into the independence of the inspection process," he said. Why would Corbett pander so brazenly to the Natural Gas industry? The Enquirer points out that Corbett received more than $800,000 in campaign contributions from drilling interests last year. A good investment for the fracking industry, considering that since taking office in January, Corbett's administration has overturned a moratorium on drilling in state forests and has refused to consider any extraction tax on drillers. Pennsylvania is the only major natural gas-producing state without such a tax. Less than a year since BP’s Deepwater Horizon offshore drilling rig exploded into flame, killed eleven rig employees and initiated an uncontrolled oil gusher that blasted over four million gallons of crude oil into the Gulf of Mexico, the London-based oil giant is asking for more. The Gulf ecosystem is still reeling from the dramatic oil and gas pollution that created underwater plumes that spanned for miles and effectively turned the ocean floor into a “graveyard.” While former BP CEO Tony Hayward promised his company would “make this right,” 300,000 Gulf residents still await their share of the $20 billion BP set aside for compensation. As put by Greenpeace Research Director Kert Davies in an interview with ABC (above), "This is not even a year since the worst environmental disaster this country has ever seen and the culprit is being led right back to the scene of the crime and being given the keys." Meanwhile, the offshore drilling contractor that owned the Deepwater Horizon rig, Transocean, is now apologizing for handing out absurd bonuses to executives for safety in 2010, including a $200,000 salary increase to CEO Steven L. Newman. Newman made $5,374,687 in 2009. 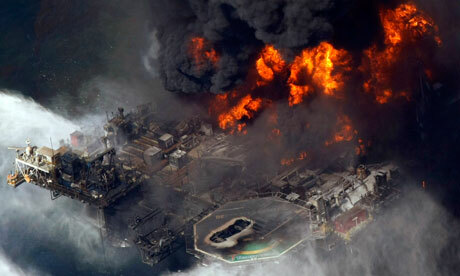 The Department of the Interior has challenged Transocean's safety claims, and has stressed that no agreement to resume drilling has been made with BP, although the company continued other operations throughout 2010 and into 2011, as had Exxon Mobil and Chevron. Royal Dutch Shell recently obtained permission for a new drilling project off the coast of Louisiana. ExxonMobil, proud owner of the gas company XTO (bought in 2010 for $31B), attempted to parry criticism of the gas extraction process called hydraulic fracturing in a recent letter to the editor featured in the New York Times. The letter, written by Vice President Ken Cohen, contained all of the untruths and PR manipulations one would expect from the anti-climate, anti-environment, oil and gas supermajor ExxonMobil. Ken writes in retaliation to a New York Times Business Day article by largely pro-gas and pro-industry “journalist” Christopher Swann, in which Swann refers to ExxonMobil’s strategy of forming a “united front against regulation" as “myopic.” Ken tacitly denies opposing regulation, saying “Along with other companies, ExxonMobil works with state regulatory authorities to develop sound, science-based regulations for oil and gas drilling.” If the implication of this statement is that Exxon supports legitimate fracking regulation, then this is a lie. Exxon opposes any attempt at regulation of their business reflexively and has opposed all attempts at regulation on fracking specifically. Ken goes on to parrot the industry mantra of how vital “clean-burning” gas is for “national energy security” and “well-paying jobs.” No mention of how fracking poisons drinking water with radiation and toxic sludge. When weighing the importance of fresh water versus the “billions of dollars” that stand to be made by energy profiteers, Ken has definitely picked a side. Ken’s letter also spouts the common industry-created rhetoric that fracking has been used safely since 1940. The truth is that the type of fracking practiced currently is significantly different than the processes used since the 40’s, and none of these processes should be labeled 100% safe. Just ask the residents of Wiliamsport, Pennsylvania, where Exxon and XTO spewed 13,000 gallons of toxic sludge into waterways used for drinking water. So much for the “responsible development” touted by Ken Cohen and ExxonMobil. Rainforest Action Network (RAN) has profiled some of Chevron's most offensive operatives as part of their campaign to make the oil giant take responsibility for massive pollution in Ecuador. After almost three decades of drilling activity that ended in 1990, over 18.5 billion gallons of toxic waste was knowingly and haphazardly abandoned by Texaco, which was purchased by Chevron in 2001. Despite documented human rights abuses worldwide, Chevron has insisted it is not guilty of poisoning Ecuadorian people (and the soil and waterways that sustain them). Chevron has crafted its case through aggressive denial, distracting advertising, staggering amounts of money, and "Human Rights Hitmen" willing to dodge and lie at the expense of people and ecosystems, intentionally boxed out of sight and mind. R. Hewitt Pate: Chevron vice president and general counsel. Pate was a Justice Department lawyer during the Bush Administration, branded by RAN as "Chevron's Karl Rove" for his distraction tactics, fabricating small-scale scandals on part of Ecuadorians and their allies in order to ignore Chevron's large-scale guilt. Diego Borja: Chevron's self-described "dirty tricks operative." Beyond linking Chevron to an "independent" U.S. lab testing samples from contaminated waste sites, Borja videotaped an Ecuadorian judge presiding over the lawsuit against Chevron and released footage edited to imply that the judge had accepted a bribe (he had not). The judge was dismissed from the case. Andrea E. Neuman and Randy M. Mastro. Both Neuman and Mastro are veteran corporate influence peddlers with DC law firm Gibson, Dunn & Crutcher, drawing attention away from the suffering of plaintiffs against Chevron by conjuring pointed personal attacks and claims of bias by the Ecuardorian legal system. Neuman specializes in stomping wronged citizens at the behest of major polluters like Dole Foods and Lockheed Martin. Sam Anson: Working for Kroll, one of several PR companies hired by Chevron, Anson was caught attempting to hire a journalist to spy on Ecuadorian plaintiffs suing Chevron. The journalist turned down the $20,000 offer and made the scandal public. More on the campaign to hold Chevron responsible for its crimes in Equador can be found at Rainforest Action Network and Amazon Watch, among others documenting the true cost of Chevron's toxic legacy [PDF]. More on Chevron can be found in our Polluter Watch profile. In a move that exposes the repeated and predictable habit of Congressional polluter allies, House Republicans have ignored a $53 billion handout over the next 25 years to oil companies that are not required to pay royalties when obtaining leases for offshore drilling in the Gulf of Mexico. This year alone, according to House Representative Ed Markey (D-MA), $1.5 billion in absent lease royalties will benefit oil companies seeking to expand offshore drilling. The leases, which give oil giants access to public property for their own profit, is another slap in the face to taxpayers who have already watched their land (and for many, their fragile livelihoods) become poisoned by industry abuse and maintained by federal incompetence. As fiscal conservatives in the U.S. House selectively look for government spending to trim, the main targets seem to be social programs instead of unncecessary billions doled out to the world's largest oil companies. As Congress scratches the back of Big Oil, fresh reports emerge of continued devestation on the ocean floor of the Gulf of Mexico, a direct result of the BP Deepwater Horizon oil spill. This failure to save wasted taxpayer money is but a small portion of the sickening annual handouts to the oil industry through subsidies. Oil Change International explains, "Estimates of the value of US federal subsidies to the domestic oil and gas industry alone (not coal) range from 'only' $4 billion a year, to an amazing $52 billion annually. Coal subsidies are roughly another 10 billion annually." Top givers to the 111th Congressional Representatives of Oil were Koch Industries ($616,513), ExxonMobil ($553,950), Chevron ($373,100) and Valero Energy ($311,250). David Koch, one of the richest men in America and owner of the largest private energy company in the United States took to the stage over the Christmas holiday to receive praise for his $2.5 million sponsorship of the American Ballet Theatre's production of the Nutcracker... and a strange thing happened. The oil tycoon was booed. John Gapper on the Financial Times Business Blog has the story. "... there were also boos from near where I sat in the balcony, followed by an angry debate in the row in front of me, with one of the booers declaring “he’s an evil man” and a couple next to her telling her to “shut up” and to leave the theatre. Mr Koch was venturing into the lion’s den in political terms, since Brooklyn is solidly liberal and Democrat, whereas he and his brother are right-wing libertarian and are alleged to have links to the Tea Party movement, which they deny." "Once Mr Koch had left the stage, the booing stopped and the ballet started." In our report last year, Koch Industries: Secretly Funding the Climate Denial Machine [PDF], Greenpeace outlined the millions of dollars that the Koch brothers have funneled into ideological and free-market activist organizations that have been fighting for more than a decade to confuse the scientific realities of climate and stall State and federal legislation to curb climate pollution. The boos are rightfully earned. ...waterways that were gifted about 800 barrels of spilled crude from the exact same pipeline last June. The community is still busy cleaning up the first mess, and Mayor Ralph Becker has expressed his own "outrage." While Mayor Becker has supposedly been a bit soft with Chevron even since June's spill, he has now explicitly stated what people around the world realize: "We cannot trust Chevron." Chevron recently paid over $400,000 for the June spill--a negligable fee compared to their $13.7 billion profit since quarter three of 2010. The new spill took place a mere 100 yards from June's disaster, stopping just 50 feet short of Red Butte Creek. For a barrage of ironic and contradictory statements from one of Chevron's representatives, check out the Salt Lake Tribune article covering the [new] spill.